Have you ever seen a turtle sitting on a log around Kings Bay? These shell back creatures are abundant throughout Crystal River. Watching them is fun. They sunbathe with beach goers, and swim deep with snorkelers. It seems that each turtle has its own personality. A turtle loves eelgrass. That’s the one thing that the turtles all have in common. Fresh water turtles loved the newly planted grasses. Kings Bay Restoration Project is bringing back eelgrass, a valuable food source to their population. 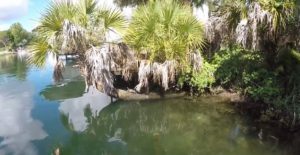 Hungry turtles grazed heavily on eelgrass in the canal between 3rd Ave SE and 4th Ave SE in Crystal River during early 2018. July 2018 monitoring showed a statistical difference in plant density because of this grazing. 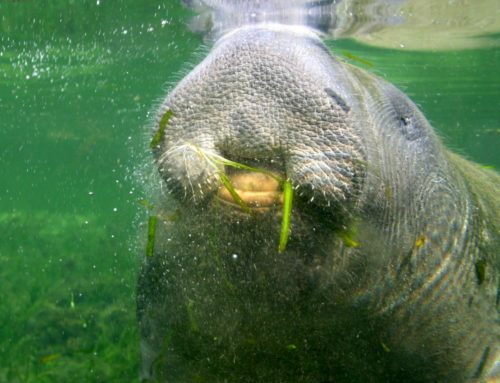 We took a look to find other studies of turtle populations grazing on eelgrass plants. 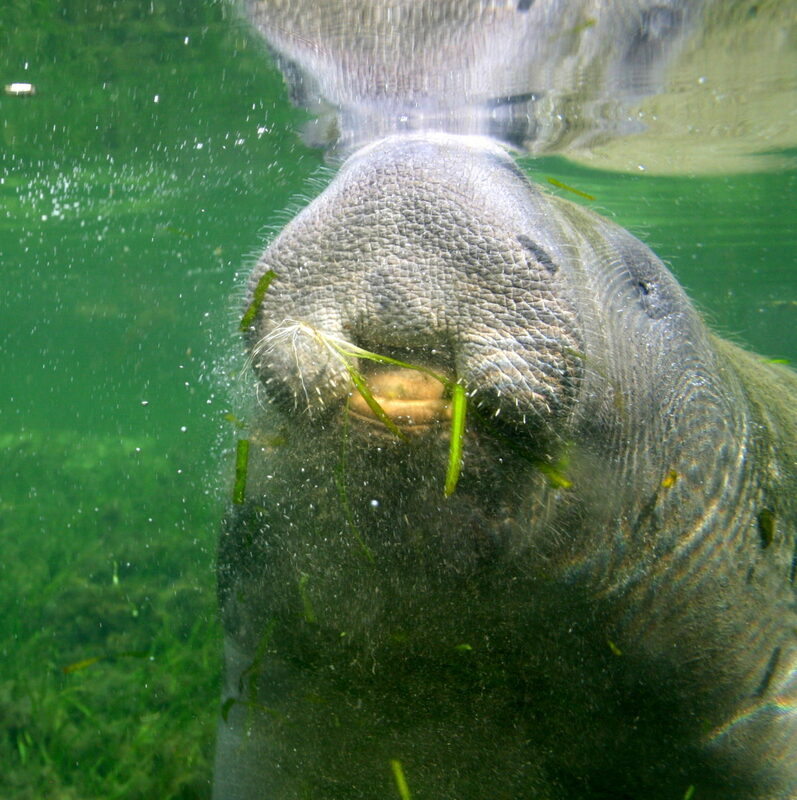 A 2013 study (Adler et al, 2013) titled An aggregation of turtles in a Florida spring yields insights into effects of grazing on vegetation was the exact study to answer our question. 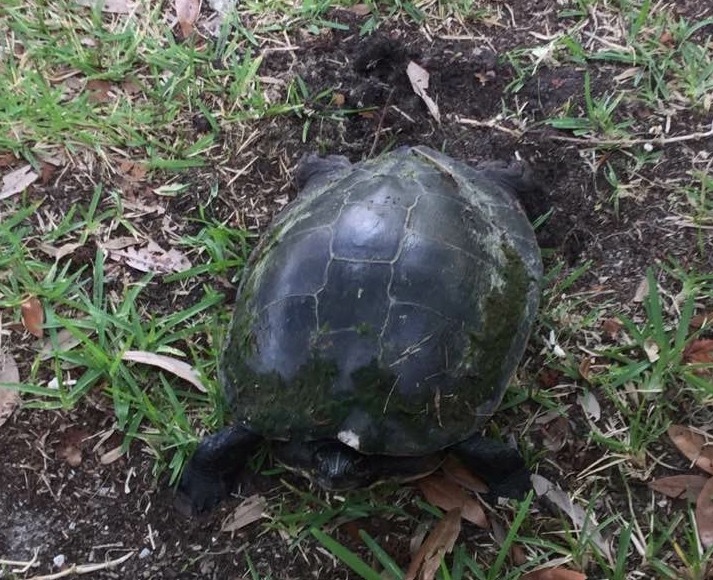 Our question is: Do turtles have a strong effect on plant density in spring settings? 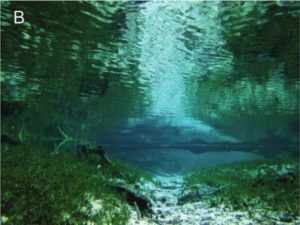 The study assesses the Suwannee Cooters (a specie of freshwater turtle) effects on vegetation in Blue Spring. 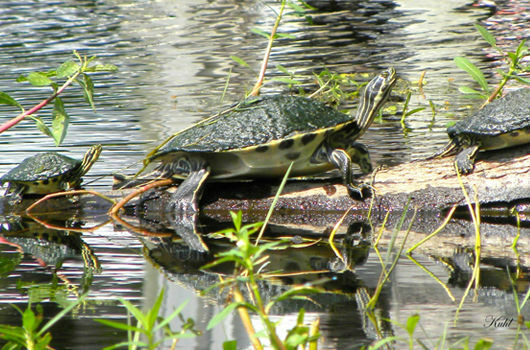 This study found that turtles can graze rather heavily on all aquatic vegetation. Seen in the photos below, picture A shows the study site before turtles arrived, picture B shows after the turtles have arrived to graze, and picture C shows the study site 1 week later. The group of turtles ate all of the Hydrilla verticillata before moving further on in the spring run. 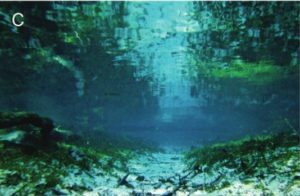 Vegetation in Florida springs is shifting from native, rooted macrophytes (ie eelgrass and other subaquatic vegetation) to filamentous macroalgae (ie Lyngbya) which may be causing the turtle species to graze heavier on a food source when available. However, this theory and other potential harmful effects of Lyngbya on turtle population and food source would need to be studied further. 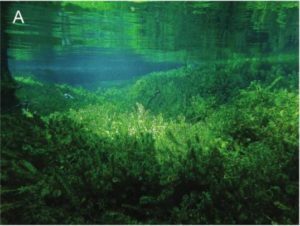 Vegetation in Florida springs is shifting from native, rooted macrophytes (ie eelgrass and other subaquatic vegetation) to filamentous macroalgae (ie Lyngbya) which may be causing the turtle species to graze heavier on a food source when available. However, this theory and other potential harmful effects of Lyngbya on turtle population and food source would need to be studied further.